When the 101st Airborne Division was activated during World War II, its first commander, Major General William C. Lee, told recruits the division had "no history but a rendezvous with destiny." Lee told his soldiers that each individual was "a necessary part of a complex and powerful instrument," which would overcome America's enemies. The 101st Airborne would go on to fight in D-Day, the Battle of the Bulge and in future conflicts including the Vietnam War, Iraq and Afghanistan. 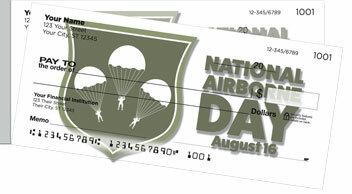 These patriotic checks pay tribute to troops who answered the call to duty, even when it meant dropping out of a plane or helicopter directly into danger. 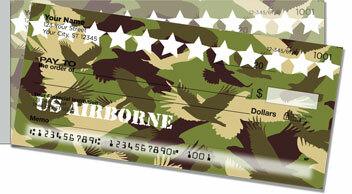 The convenient side-tear format of your new checks will make it extra easy to pull them from the pad. 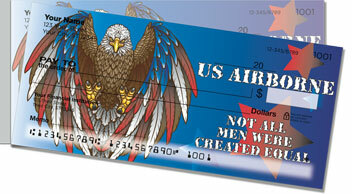 That means no more wasted checks that accidentally rip. 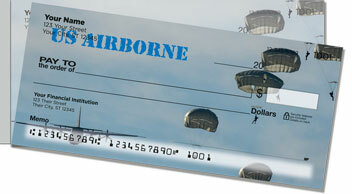 Get your own US Airborne Side Tear Checks today! You can also order matching mailing labels.